Being a busy mom who spends a lot of time typing away on this laptop, I gave up giving myself at-home manicures about two years ago. It was something I very much enjoyed. When my nails looked beautiful . . . I felt more beautiful. To get a bit of that feeling back, I try to give myself pedicures once in awhile. Even that is a challenge because I am guaranteed to be interrupted at least once. Even doing my toes for this review, I had to redo one nail because I had to get up to help one of my children with something and managed to severely smudge that nail. 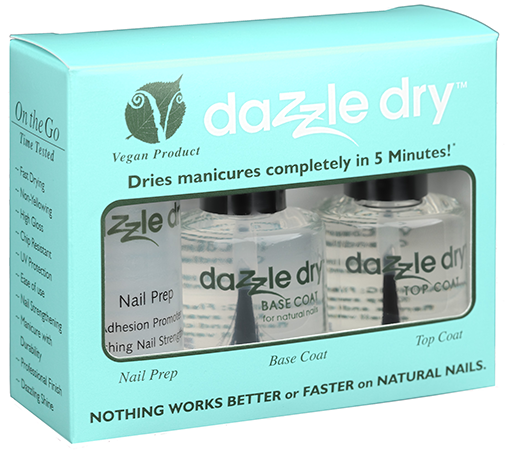 Dazzle Dry, a nail care line from VB Cosmetics, offers a vegan nail polish system, which uses no animal testing. These products contain no harmful chemicals and are free of Toluene, Phthalate, Camphor, Formaldehyde, and Nitrocellulose. As a result, they do not cause yellowing of your nails. Not only is their nail lacquer a quick-drying nail polish, but their base and top coats are as well, making this the perfect nail polish system for a busy mom like me. If you have acrylic nails, you can apply Dazzle Dry nail polish without prepping your nails or applying a base coat. If you are working with natural nails, you just need to wipe them with the Dazzle Dry Nail Prep first. Doing this promotes adhesion, strengthens your nails, and sanitizes the surface of your nails. The next step is to apply a generous coat of Dazzle Dry Base Coat. This takes about two minutes to dry completely. Then you can apply the nail lacquer. I used two coats and allowed it to dry two minutes between coats. I waited about 5 minutes before I applied the high gloss Dazzle Dry Top Coat. The top coat was completely dry in 10 minutes. Some quick-dry top coats set within ten minutes, meaning you can gently touch the surface without smudging, but they are not completely dry and can be smudged and dented. The one improvement I would like to suggest about the Dazzle Dry nail products is to make the brushes a little bit thinner. The current brushes are thick and round. Although they gave great coverage, they were slightly difficult to control while painting along the edges and near the cuticles. 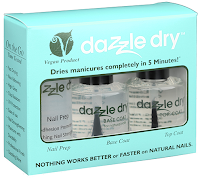 To view the full line of Dazzle Dry nail care products, visit VBCosmetics.com . You can order Dazzle Dry products right on that website or from other retailers, such as Amazon.com . You can also find out more about Dazzle Dry Quick-Dry Nail Polish on Facebook. Thank you to VB Cosmetics for sending us sample Dazzle Dry products free of charge to base this review upon.